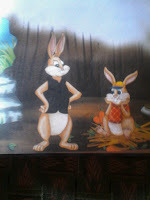 Once a father rabbit lived with baby rabbit in a forest. He made his house in the trunk of a tree. The house had all necessities including a soft bed of grass, a pot of fresh water and delicious fruits. The baby rabbit was very naughty. He paid no attention to his father's advices. Once there was sever drought in the forest. The grass and the leaves dried up. "Give me this carrot. My children are starving. I will feed my children. "The little rabbit took pity on the doe. He gave his carrot to the doe. 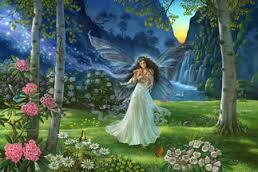 At once, the doe changed into a fairy wearing golden crown and said: "I am pleased with your kindness. 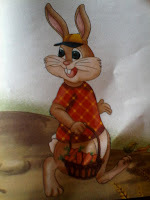 "She gave him a bucket full of juicy carrots and promised him to help him in difficult time. The little rabbit brought the bucket home. He narrated the whole incident to his father. The father was proud of his son. The bucket of carrots finished in few days. Then the father rabbit said to his son: "I am going to a nearby forest in search of food. There are some peas for you at home." Before his departure, he advised the baby rabbit: "Do not open the door in any case." The little rabbit locked the door. Soon the wolf and crocodile got to know that the little rabbit was alone at home. They said joyfully: "It is a golden opportunity. Lets go and eat the little rabbit. " Firstly, the wolf came outside the house and knocked the door. He said: "I am watchman. Your father is waiting for you. He has asked me to fetch you. Come out little rabbit." 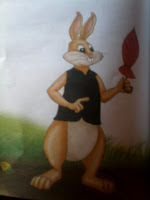 But the little rabbit acted upon his father's advice. He said: "Go away from here. I won't open the door. "The angry wolf started to gnaw the door. Suddenly a snare of rope appeared from the air, seized around the wolf's neck and dragged him into a pit. Then the crocodile knocked the door. The little rabbit asked: "Who are you?" Crocodile replied: "I am your uncle. I have tomatoes, carrots and salad for you. Open the door. "The little rabbit said: "I won't open the door. My father has forbidden me to do so." 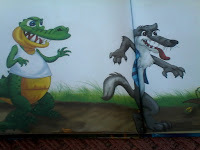 The crocodile started to strike the door hard with its tail. The little rabbit was scared. At this moment, the snare appeared again. It caught hold of crocodile's neck and dragged him into a pit. Next, the snake knocked the door. 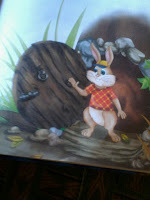 The little rabbit refused to opened the door. The made the snake angry. The snake entered the house through a hole. The little rabbit was terrified. 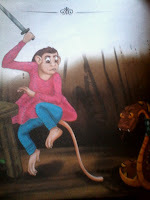 All of a suddenly a female monkey holding a sword appeared. She killed the snake with a blow of sword. The little rabbit hid in a corner. The monkey turned into the fairy wearing golden crown. The fairy said: "This is the reward of your kindness. Allah has rewarded you because you obey your father's advice." Saying this, the fairy disappeared.